Found yourself searching about how to build a go kart? You’re not alone. Many consumers like to have a custom go kart and tend to save money by doing so (unless it’s extraordinary and rather advanced). Buying a go-kart can sometimes be out of one’s budget; the solution becomes to build your own. Building a go-kart comes down to a few simple steps which will be broken down below. Develop a plan. Many projects, even those not even related to building your own go-kart, fail because their is no direct plan. A goal may be set but no steps were written down to acquire such a goal. In the contrary, however, steps may be written but there sometimes won’t be an endpoint and a conclusion may never be found. You’d find yourself building and building not knowing where to stop or when the project is complete. 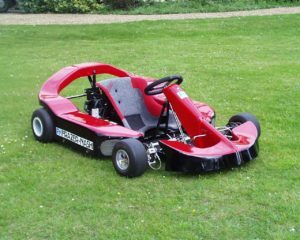 A few things that should be included into your homemade go kart are: customization’s/personalizations, shape of the go-kart, the size, as well as the parts (wheels, engine, chassis, brakes, etc.) – one can find the parts needed in a go-kart kit. After a plan has been written and the parts are acquired it’s time to put things together. A welder may be needed if you didn’t purchase the kit. Kits will make the whole process a lot easier, though if you persist to do it all by scratch, it can still be done. Without a kit, you’ll need to ensure everything was put together well and, most importantly, safely. Mount everything correctly, drill your seat (preferably out of plywood) to the frame, confirm everything is in place and you’re ready for step three. After step 1 and 2 have been completed, we’ve come down to step three. Step three is the simplest and what it’s all come down to. It’s the shining moment to see if all the work that was done paid off – test your homemade go kart. Get it inspected, go for a test drive, and fix any tweaks if needed. After this long process, you will now have your custom-built go kart available at all times!